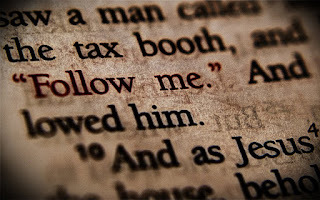 Recently I've been re-reading a fantastic book by the late Martin Franzmann called Follow Me: Discipleship According to Saint Matthew. This post was inspired by that book and will also be used as my newsletter article this month. With those two words Jesus called individuals to be His disciples. Note well, this was not merely a Rabi calling a student to come and learn from him. In fact, Jesus never even permits others to admire him as a teacher. When the rich young man (Matthew 19:17) and both Nicodemus (John 3:1-21) and the Jews in John 7 express admiration for Jesus as a great teacher (or Rabi), Jesus dismisses such talk. Jesus is no mere teacher, but the Messiah. And when He calls individuals to follow Him, He isn’t calling them as a teacher to come and simply learn a better way to live. He isn’t merely calling them to follow His teachings, but to follow Him! From spending hours playing baseball and wiffle ball in our backyard with my brothers, to little league, American Legion league, high school, and college, baseball has been a pretty significant part of my life for a long time. One of the great things about baseball is that it teaches you. It teaches you lessons about life and how to deal with difficulty. For instance, as a pitcher I had to learn that getting upset about things didn't help the situation. If I jammed a hitter and he was lucky enough to have the ball fall in, even though I did my job, the batter reached base. If a fielder booted a routine ground ball, I didn't do anything wrong, yet the batter was now on base.